A lot of famous architects have been there in the world with their astonishing work. Their splendid work not only made them renowned across the globe but also benefited their clients a lot. Following are some of the world class famous architects with their fabulous work. Born in Baghdad on March 31st, 1950, Zaha Hadid got her higher education at Architectural Association School of Architecture, American University of Beirut(1972—1977). Beyond all doubts, she dazzled the whole world with her striking work for decades. She designed notable over-the-top buildings and her elegantly flamboyant creations seemed more natural than man-made. Her only private residential design, the Capital Hill Residence, has recently been finished in Russia’s Bharvikha forest two miles west of Central Moscow. This project was actually the dream of the international real estate developer Vladislav Doronin who met Zaha in London and saw in her one of the famous architects who had the vision to create his dream home. In all my real estate career, I have never seen renderings so true to the final product. At the first glance, Zaha’s design appears much like a spaceship landed and submerged in the forest floor, but gradually it begins to seem something to be studied in detail. Doronin wanted to have his master bedroom high enough to enable him to look out its window and see above the trees. Zaha granted his wish by raising the master bedroom to 117 feet above the ground and connecting it to the rest of the $140 million home by a slender column. Moreover, the owner may also enjoy a 65-foot long swimming pool, spa, and gym, adjacent to a Japanese garden and a nightclub as well. It is a unique feeling seeing something you have meticulously planned become reality. This striking and ambitious building is a testimony to her genius. She created the perfect livable sculpture. As one of the Iraqi-British famous architects, she was the first woman to receive the Pritzker Architecture Prize in 2004 and the UK’s most prestigious architectural award, the Sterling Prize, in 2010 and 2011. This immensely famous architect died at Miami, Florida, the USA on the 31st of March, 2016. He was born at Richard Center, Wisconsin, The United States, on June 8, 1867. He got his degree from the University of Wisconsin and grew up into a renowned American architect, interior designer, writer, and educator. Out of 1000 structures he designed, 532 got their completion. He always believed in organic architecture, a term devised of his own, meaning thereby to design such structures as are harmonious with humanity and nature. Throughout his long and prolific career, he brought the American architecture to the forefront. In fact, he revolutionized the 20th-century architect by applying clean geometries with an emphasis on horizontal planes. In 1909, In the state of Illinois, in the River Forest, there was built the Prairie- style Ingalls House reflecting the architectural intellect of Frank Lloyd’s fabulous style. The house really boasts of a cantilevered roof and a balcony exaggerating the horizontal lines of the design. Plenty of light comes through the three windows present in each room. Overall the house comprises of four bedrooms, one full bath and two half baths all covering a complete area of 2800 sq ft. With an asking price of $899000, the house thoroughly has art-glass windows with copper caning which enhances its beauty a lot. This great and famous architect was awarded the great Twenty-five Year Award for the first time in 1973, then in 1974, 1983 and 1986. Earlier, he had also received Royal Gold Medal in 1941 and the AIA Gold Medal in 1949. To meet his logical end, Frank Lloyd died in Arizona on April 9, 1959, but his work will live forever. The American (July 8, 1906—– January 25, 2005) was born in Cleveland, Ohio and studied history and philosophy at the Harvard University. Johnson started his career not as an architect but as a curator at the Modern Architecture International Exhibition held at the Museum of Modern Art. Later on, he developed a strong passion for architecture and won great success as one of the famous architects within a few years. Though he created a lot of splendid marvels, his Glass House in New Canaan, Connecticut drew significant attention worldwide when it got completed in 1949. The Glass House is an example of the early use of industrial material such as glass and steel in home design. Built a little away from the street with visitors having to walk over the grass and gravel strips to approach it, the Glass House has the kitchen, the dining and the sleeping area all composed in one glass-enclosed room. Constructed on the ideas of the famous architects from Germany, and with the dimensions of 17 m length, 9.8 m width and 3.2 m height. 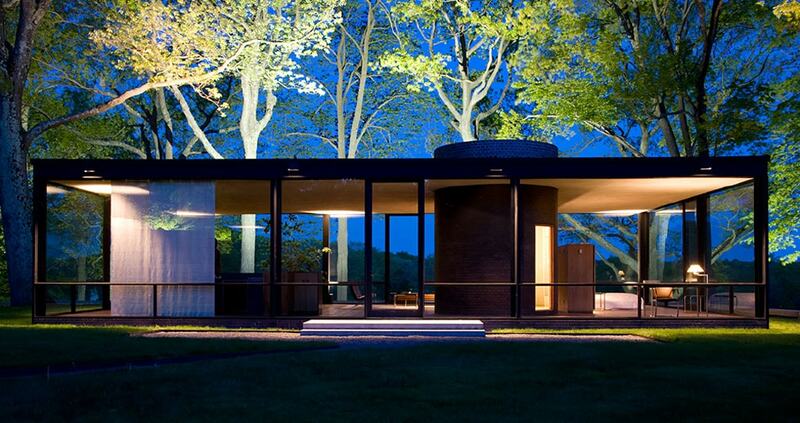 The amazing Glass House has the views of the landscape as its “wallpapers” designed by Johnson and Whitney together. Exterior sides of this house are charcoal-painted steel and glass while its brick floor is 10 inches above the ground. The interior is open with the low walnut cabinets dividing the space artistically whereas a brick cylinder contains the bathroom. Overall, this is a masterpiece of architecture from one of the ever-memorable famous architects. He was awarded many prizes of which AIGA Gold Medal came in 1972. For his excellent Glass House, he was given The Twenty-five Year Award in 1975. Besides, he was also blessed with the Gold Medal from the American Institute of Architects in 1978. He also enjoyed the honor of receiving the first ever Pritzker Architecture Prize in 1979. Hence, these were a few ever famous architects with their marvelous pieces of aesthetic sense and long lasting beauty. These historical houses served not only as the trendsetters for their respective cultures and civilizations but are also the assets of the whole world of architecture. T0 0his clearly shows that an artist may die but his work never dies.